Today, NYC.gov launched a new digital front door. We welcome this experiment known as AlphaLabs, civic tech office hours, and, all the other things that the Mayor’s Office of Digital Strategy is doing to make government more accessible. ALSO – We love that Alpha.nyc.gov is built on BetaNYC’s award winning ReinventNYC.gov hackathon idea! Team BetaNYC’s mockup for ReinventNYC.gov hackathon. 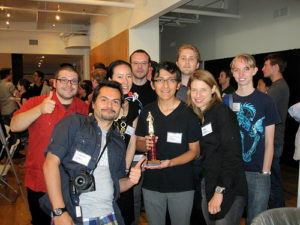 Team Appleseed with “Best User Interface” trophy. Back when we were just a couple of kids and a meetup.com account, a few of us participated in the City’s first hackathon — ReinventNYC.gov. 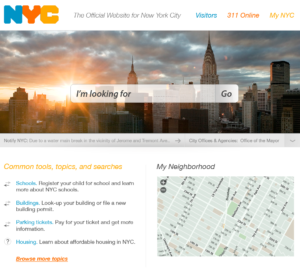 Our idea was to build a google like interface powered by NYC 311’s inquiry API. We envisioned a super simple, search driven interface. The more you searched or called NYC 311, the better NYC.gov would get at returning relevant information. NYC.gov would mirror NYC 311’s ambiguity. You didn’t need to know who provided the service. All you needed was a question and we would provide you with relevant results. With this idea, we won best user interface. Many of the other participants featured similar interfaces. These ideas were so good, many of them are baked into the NYC.gov we know today! 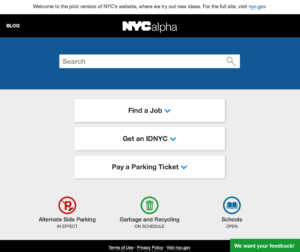 Alpha.nyc.gov is exactly the type of NYC.gov we envisioned a little less than five years ago. We are happy to see the NYC Digital Playbook be put into action (and follow in the footsteps of NYC Council Labs, the City Council civic hacker SWAT team). As the Mayor’s office has embraced participation and feedback as a fundamental part of Alpha.NYC.gov, we want to see this tool’s core, the code, and product roadmap opened in a way that truly embraces the NYC Digital Playbook. Now, more than ever, it is important for the alpha.NYC.gov team to stand on the shoulder of giants, embrace the same software development practices embraced by the US Federal Government (and UK, NY State Senate, Code for America). These software practices are secure, smart, resilient, and they save us money! We congratulate this administration on taking the second step and look forward to working with them as they take the next.